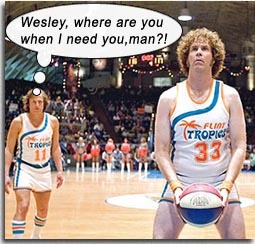 Will Ferrell stars as Jackie Moon in SEMI-PRO, the owner-coach-player of Flint Michigan basketball team, the Tropics, last place in their local Basketball Association. When the Association accepts a merger with the NBA, they threaten to drop the Tropics from their roster, so in order to make his team’s NBA dreams come true, Jackie Moon must attempt to do the impossible: make a Will Ferrell movie that is funny. Scot Armstrong (OLD SCHOOL) writes a movie that will neither appeal to fans of comedy or basketball, and Kent Alterman (an executive producer turned director with this debut) should have kept his former job. As Jackie Moon tries to rally his team into a mean machine, the gags, the stunts, the promotions, the interpersonal relationships are all over the place; it’s not cohesive. Semi-Pro refers to athletes who are paid, but must also have other jobs to supplement their income. SEMI-PRO looks like it was made by a production crew in the same boat; the tone of the movie keeps shifting with each scene. Nothing works. The movie is a mess! Ferrell is surrounded by regular compatriots, Will Arnett, David Koechner, Andrew Daly and Andy Richter (the Rob Schneider of Will Ferrell movies). Andre Benjamin (OutKast) is ubercool as a Tropics player who invents the Alley-Oop, Woody Harrelson is a washed-up player trying to make a comeback (does anyone remember this guy was in the kinetic WHITE MEN CAN’T JUMP? ), Rob Corddry is a fan who worships Woody so enthusiastically that he relishes his own wife (Maura Tierney) rekindling her affair with him, and Will Ferrell shoots for another absurdist hoop and misses. Starring: Will Ferrell, Woody Harrelson, Andre Benjamin, David Koechner, Will Arnett, Maura Tierney, Rob Corddry, Andrew Daly, Andy Richter, Matt Walsh, Jackie Earle Haley.